Tremendous Savings — Buy at Fractions of Army O Navy costs. LST's; LCVP's; Aircrafts; Helicopters; Marine Engines; Radar; Sonar; Radio Telephones; Walkie-Talkies; Nautical Instruments; ETC. ALSO: — Jeeps; Trucks; Tractors; Amphibious Vehicles; Farm Machinery; Farm Implements; Generators; ETC. Thousands of other items too numerous to mention. SEND FOR: "Depot List O Procedure" $1.00 P.O. Box 8 (Dept. 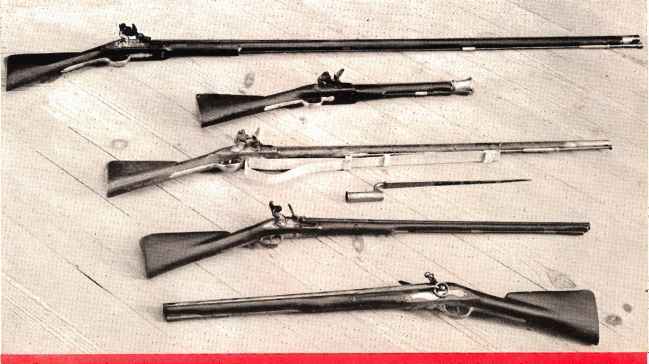 CU) Sunnyside 4, N. Y.
HOLLYWOOD PISTOL & REVOLVER t SWAGE DIES for 38, 44 & 45. Other calibres available. Per set $39.50. complete as shown, "special" $229.25, stripped $79.95. Rifle, Pistol and Shotshell Components Carried in Stock • Free Literature • Discounts to Dealers • Prices F.O.B. Hollywood ■ Terms: Buy Now—Pay Later. (Continued from page 58) knights—were marks of rank, carried by the sergeants and officers. They were not designed as weapons, but who can doubt that a hard pressed sergeant for want of a belter weapon would not use these symbols of authority to strike his adversary? For the admirers of good sleel blades, the Williamsburg arsenal shows the swords and sabers of the time, both those of the infantry the short thrusting swords—and the slashing sabers of the horsemen. And there is hanging on one wall a reminder that all fighting men of the period of the French and Indian War and the Revolution did not wear the popularly-imagined knee breeches and blue and buff coats. Many wore riflemen and frontiersmen suits of buckskins. From these uniforms the Americans gained the name "blackshirts," for with continued usage the long skirt-like buckskins became filthy black with dirt and grease and burned powder.